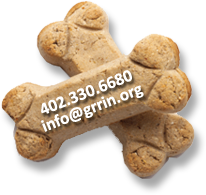 A Tribute to Molly: a short time with GRRIN at the end of a long life. As the saying goes, it takes a village. This was certainly the case with sweet Molly. At 13 years old she was a senior among our wonderful senior foster dogs, and a village of volunteers helped her get to her final resting place on January 4, 2011. Molly was living with 2 other dogs, on their own, in their owner’s home for many months following the owner’s death. A volunteer with No Pets Left Behind rescued Molly from her abandoned home and took her to a vet where she received evaluation of her health and needed health care. While No Pets Left Behind waited for GRRIN to locate a foster home for her they continued to care for Molly in a volunteer’s home. 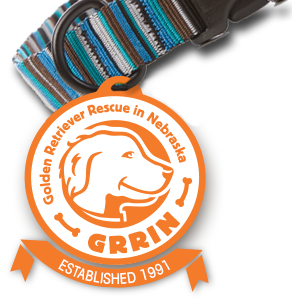 The next step of Molly’s journey involved a myriad of GRRIN volunteers including a hotline volunteer, intake worker, foster coordinator, transportation coordinator, temporary foster home, foster home, caseworker, rescue team coordinator, and board members. Molly proved to be a very sweet and adaptable girl. She never met anyone she didn’t like and the feeling was mutual. Initially in foster care Molly began regaining some strength and weight. However, at her age it proved to be too large a task for her to recover from the 6 months she spent alone in her home after her owner died. After just 3 weeks with GRRIN Molly crossed the Rainbow Bridge. We believe she has been able to reunite with her recently deceased owner. While all those who have met Molly will miss her we know she is in a better place. Molly has given us the opportunity to reflect on all the volunteers who would and will gladly do it all over again to rescue the next dog, and the next, and the next.